Whitely has always been looking forward to spend some time with her dad during the summer. What she wasn’t expecting though was her dad introducing her to his fiancée and her future step siblings. Whitley was angry, frustrated and felt completely alone. The perfect summer plan that she has with her dad turned out to be one hell of a nightmare or was it? 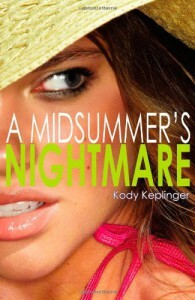 Kody Keplinger is one of my favorite contemporary authors no doubt. She has this way of making a story out of a very hard life issue. I have read her other books Shut Out and the Duff which I both loved. Ms Keplinger’s books don’t just have great characters and interesting story line but it also it has substance. It has a message behind the witty lines and actions done by the character. In A Midsummer’s Nightmare, we are introduced to Whitley Johnson who was a very angry girl. To tell you honestly, I didn’t like her all that much because she was bitter, sarcastic and she was throwing away people who actually wanted to care for her but at the same time I felt sorry for her. It wasn’t her fault that her parents were not in good terms and she was the one who has to suffer for it so yes I was not very happy about her choices but really who could blame her for being the way she was? I surely won’t because if I was in her position I probably would be angry and upset and I don’t know maybe a little crazy too. Would I have preferred a different character as the main character? No! It wouldn’t have been believable. So I liked the fact that she was flawed and angry because it makes the whole book seemed genuine and real. Now I want to talk about Nathan. Gosh this guy is just so nice. I mean after you had a one night stand with someone, how many guys will even ask for your number? Not a lot right? But Nathan did which means he was a decent guy and Whitley was stupid. Nathan was a great guy and I loved him more and more as I read about him. At first he got me confused but he redeemed himself and made me even love him more. Where are all the guys like Nathan? For me all the secondary characters made this book a good read. Basically, the story didn’t just revolve around Whitley or Nathan. Everyone had their own part to play. Nathan’s little sister Bailey was just a sweetheart. If I would have a stepmother, I wish that it would be someone like Sylvia. She was warm and compassionate. Unlike other stepmothers, she really cared about Whitley (more than her real parents if you ask me). Harrison was funny and good friend. Then there were Whitley’s parents who I found very selfish. They only thought about themselves and rarely thought about their daughter who was having issues and was caught in the middle. I liked this book but not as much as the Duff. The message was there but I felt that the ending just felt a little lacking for me. How things ended was not really what I would have wanted it. It just didn’t work out for me. Too rushed maybe. What I liked most about this book was how it dealt with a very sensitive topic without making it sound preachy. This book for me is not just for teenagers but also for parents that have teenage kids. I think issues with parents nowadays are that they barely listen to their children. They assume that everything is fine because they don’t complain and all that but sometimes they have to be observant. I’m saying this because I’m a mother too (although she’s only three) and I don’t want my kid to be drinking and partying too hard just because I don’t listen or take care of her. One thing I also noticed was that it followed a flow. 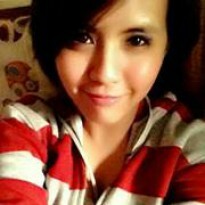 Girl became rebellious because of something happened. Then people help her out and then she becomes better. Although I have already seen this formula in other books before, I can’t help but still like this book. There was just so much emotion in it that I couldn’t help but be attached to it.